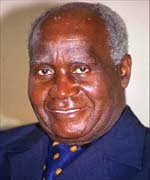 Zambia's first president Dr Kenneth David Kaunda will be guest on the eve of our special Zambia's 46th independence celebration and anniversary show. Dr Kaunda will conclude our three part series of 'Zambia then and now' down memory lane as he shares with us his earlier years of life as a school teacher and of family life together with Mama Betty Kaunda. At what stage in his life and what really prompted him to get involved in politics and the years leading to the struggle for independence.